In the last couple of days I’ve posted a couple times on taxes. In one post, I observed how hedge fund managers have radically lower tax rates than the most of us because of a loophole introduced in the Bush-era tax cuts. Yesterday, I showed graphically how average income tax rates are actually lower than most people think. In that last post, I introduced the idea that comparing income tax rates alone isn’t adequate. Since incomes below $106,150 are fully taxed for payroll taxes (Social Security/Medicare) but income over that threshold is payroll tax-free, the gap in average tax burdern between high income and median income is much smaller than most think. But you may be asking what about other taxes? What about property taxes and sales taxes and state income taxes? 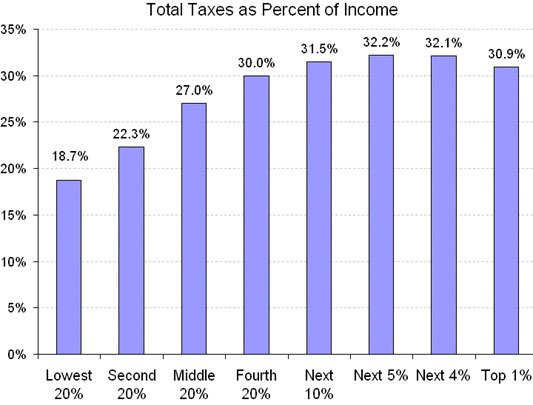 Source: Citizens for Tax Justice Horizontal axis shows the income group. Vertical axis shows the percentage of income that the average member of that group pays in taxes. Taxes include all federal, state and local taxes (personal and corporate income, payroll, property, sales, excise, estate, etc.). Incomes include cash income, employer-paid FICA taxes and corporate profits net of taxable dividends. So what do we learn from this? It shows us that if we look at the overall tax system in the U.S., the complex patchwork system of federal-state-local income taxes, payroll taxes, property taxes, sales taxes, etc., we are pretty close to having a flat tax system. The poorest, lowest income folks pay 18.7% of income as some type of tax while the the richest 5% do pay more, but they only pay 32.2%. What is really stunning is how the top 1%, the really-really rich multi-millionaires actually pay less average tax rate than the those who are only rich enough to make the top 5%. It must really be nice to be so rich that Congress tweaks the tax code just for you. So the system is very, very mildly progressive. A progressive tax system is one where the higher your income, the higher your average rate is. To make a system progressive, you must have higher marginal tax rates for higher income brackets. A regressive system is one where the effective average tax rate goes down as your income goes up. In general, sales taxes and payroll taxes are regressive. That’s why the overall system is relatively flat. While the federal income tax system is somewhat progressive (although much less so since the Reagan & Bush cuts), that progressivity is offset by a regressive payroll tax and the regressive sales taxes of various states.